Delivery day for the She Shed. 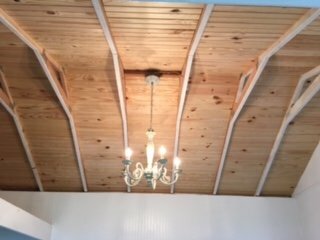 The chandelier in the interior of the She Shed. Steve, relaxing on the day bed in the She Shed. The interior of the She Shed under construction. The exterior of the She Shed with it's very own house number. 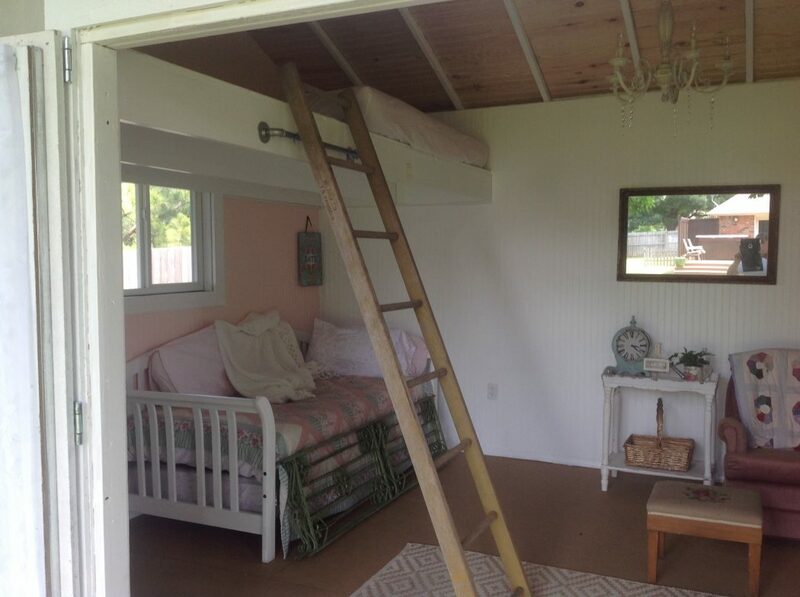 She Sheds are a growing trend on Pinterest, with plenty of boards and pins dedicated to the phenomenon. 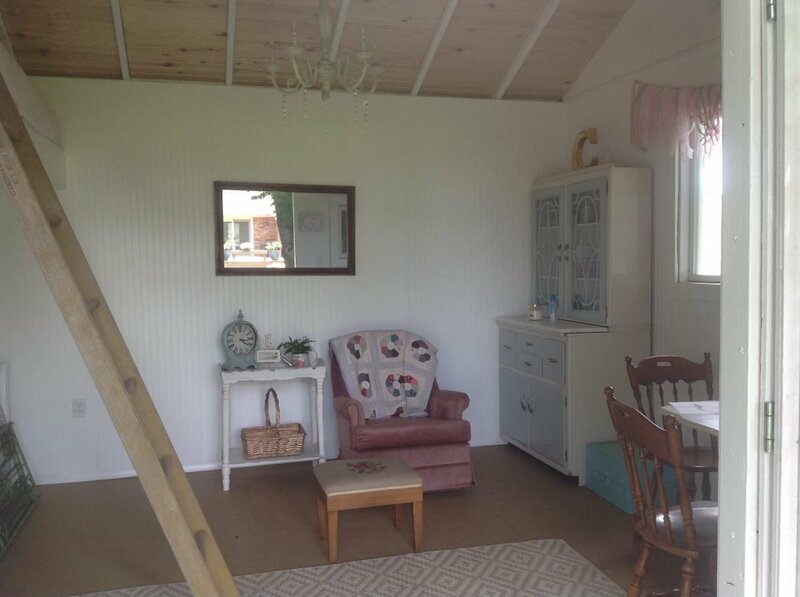 In fact, Suanne Carlson used Pinterest to find inspiration for her very own She Shed. After raising a house full of sons, Suanne decided that it was her time to have a space of her own to pursue her interests in crafting and a love of reading. Her husband Steve took one look at her Pinterest board and knew they had to find the best shed on the market to stand up to her plans. 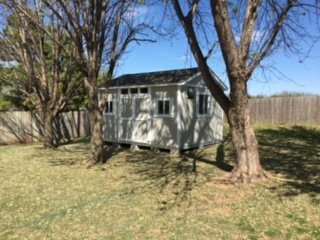 The Carlson’s shopped around to look at the options for a backyard shed and they quickly decided on Tuff Shed. 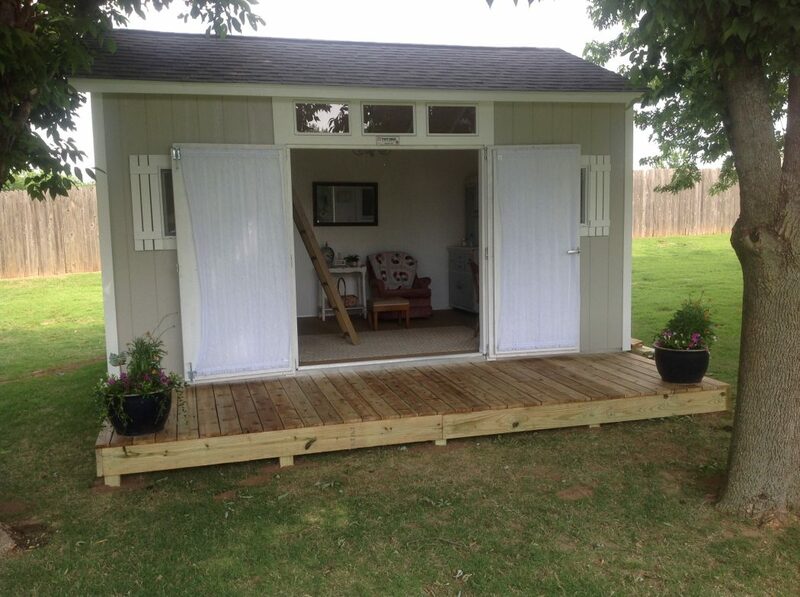 “We loved all the options to customize the shed. We liked the displays but knew we wanted to add more windows and maybe expand the loft,’ says Suanne of the customization process, ‘They helped with every step.” The Carlson’s selected a 12×16 Pro Tall building with double doors. They also extended and lowered the loft and added a few extra windows. The building looked impressive but it became even more of a haven when Suanne and Steve got to work designing and decorating. 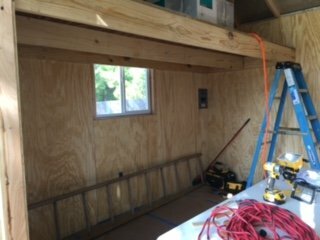 Completing projects during the weekends, Steve and Suanne were able to insulate the She Shed, add peel and stick tile to the loft, and bring a contractor in to outfit the building with electricity. 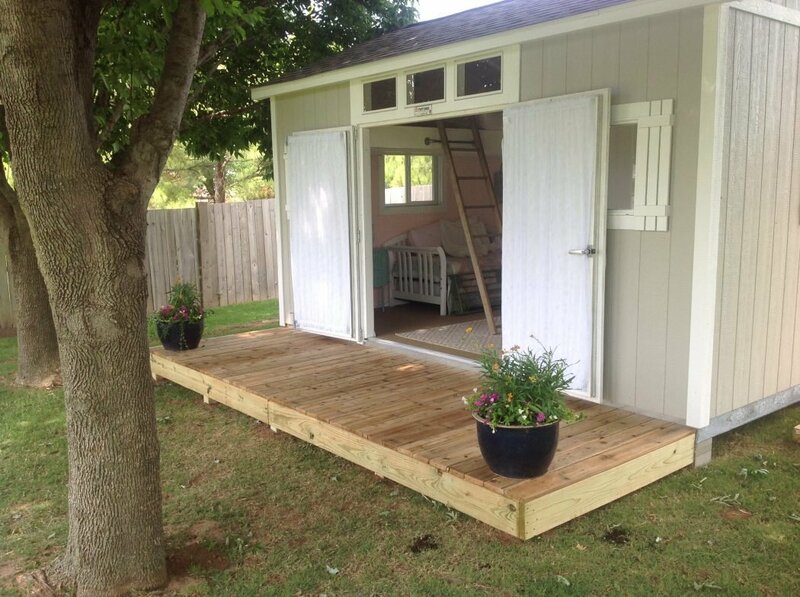 With the addition of shiplap panels on the ceiling between beams, interior paint, and an exterior deck, the She Shed is truly one of a kind. 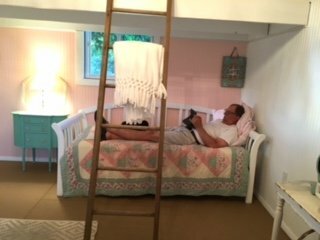 Suanne and Steve found an antique ladder for the loft and an old fashioned baker’s cabinet to go alongside the furniture they already owned. 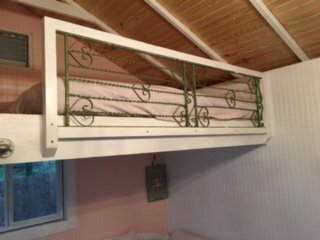 The ladder is anchored to the loft, which was completed with garden wire fencing along the edge and futon mattress the Carlson’s grandchildren sleepovers. Do you deliver and set up?? I’m in Overgaard AZ. Where can I find a price list and plans? Hi Nancy, thanks for reaching out! Our nearest location to you is in Mesa, AZ but our teams do deliver and install our buildings. You can find our list of building styles and price points on our Build-A-Quote configurator here: https://www.tuffshed.com/quote. After you’ve found the building style and size you’re looking for, we recommend reaching out to the Mesa team. They’ll be happy to help from there. I like this shed without the loft feature. Is there a product like this in 12×16 but not so tall? Sorry, I looked through the pictures again and realized although it has a loft, it’s not very tall at all. 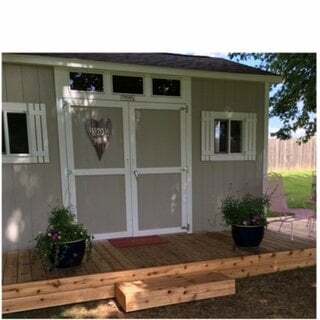 Hi Keisha, since our buildings are fully customizable you can work with your local Tuff Shed office to design it the way you like. They’ll be happy to help put together a design that fits your needs.